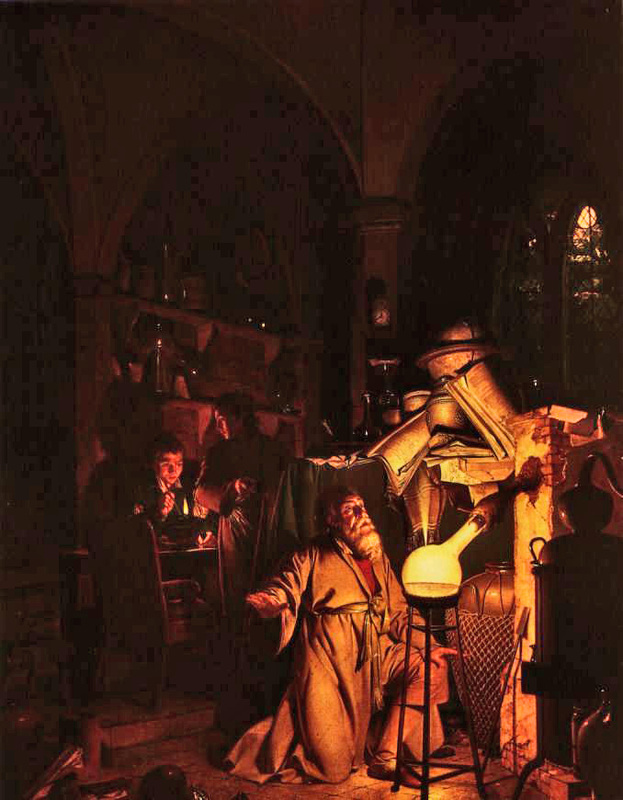 An alchemist is an individual specialized in alchemy, chemistry and the marvellous world of potion making. Any class can choose to become an alchemist, although wizards might be best suited since a lot of the alchemist’s work depends on his intelligence. Once an alchemist learns how to make potions, he can add 20 to the DC in return for being able to research and create potions while adventuring, as long as he has brought a portable travellers lab kit. Such a kit costs 10 times its actual worth in order to function properly, but also reduces the creation cost of potions by 50%, and will not run out of resources. Example: Tim, the adventuring alchemist, has brought his portable kit in order to create Healing potions. A Healing potion costs 200g to create and demands at least a kit worth 200g (in order to research the actual potion, Tim needs a kit worth 2.000g, but let’s assume that he spent 2.000g worth of resources at his lab to do just that). A kit worth 200g costs 2.000g to create, but once Tim has such a kit, the cost of every Healing potion is only 100g, and those costs are taken from his copper/silver/gold/platina/gems, NOT his kit. So the kit will never decrease in value, although Tim might run out of actual gold to pay for his potion making. Transformation: This ability allows the alchemist to transform certain metals and objects into materials useable for his own research and creations, reducing his need for obtaining obsure materials. The maximum worth he can transform every day equals his class level in the various metals (a lvl 3 Alchemist can transform 3 copper daily, a lvl 4 can transform 4 silver and a lvl 14 can transform 14 gems). Transmutation: The alchemist gradually discovers how to make precious metals out of seemingly nothing and anything as he advances in level. Once he learns transmutation, he can create his class level in kilos of the various metals pr. month (A lvl 20 alchemist can manufacture 20 kilos of metals monthly, and chooses himself how much of that will be copper, silver or gold). Eureka! : The alchemist disovers the hidden secrets behind potion making and do no longer create broken potions on a natural 1 (although 1 is still a failure and 20 is success). This means that the player rolls all Potion Maker proficiency checks himself from now on. In addition, whenever the alchemist creates a potion (any potion, even epic ones), he creates 1d4 potions instead of just 1. In addition, the alchemist is granted Augmented Alchemy epic feat for free. The alchemist is also the only class who can benefit from this feat when it comes to creating potions.